Well, as I said I was interested in rebuilding my alloy arms. Here is how it went. 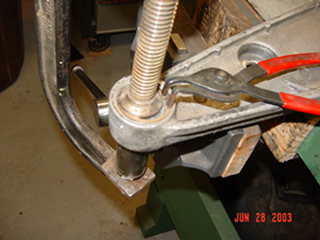 Place your control arm in a vice or some sort of clamping mechanism to secure it. 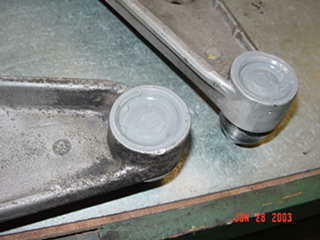 You may have to begin by removing epoxy or some sort of sealant that is sometimes used to secure the snap ring. Also remove the old boot - it's held on with a spring that you may or may not need to re-use - depending on your particular repair kit. 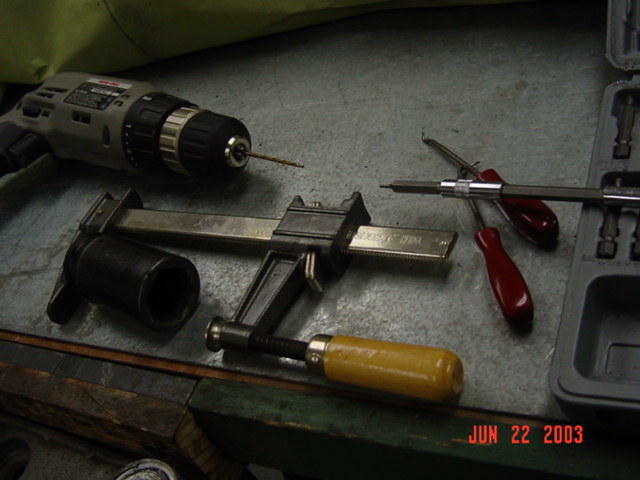 Above (left) are the tools I used to open up the ball joint. I have all sorts of clamps in my shop but this cheap, woodworking clamp gives the best access to the snap ring. Notice (above right) how I have it placed just off-center closest to the point where the snap ring opening is. 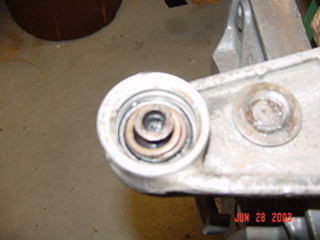 Also, it is hard to see in this picture but there is a large deep well socket over the threaded end of the ball joint pin. This is needed for even clamping pressure. (For the moment, ignore the tool coming in from the lower right. Hopefully, you won't need that.) Attempt to hook the edge of the snap ring and draw it inward. From that point just work around the circumference of the snap ring and it will come out. You may be tempted to drive a sharp tool under the snap ring. This is NOT recommended - the the snap ring's groove is critical to the strength of the balljoint mount and is machined into some pretty soft material - it is easily damaged. 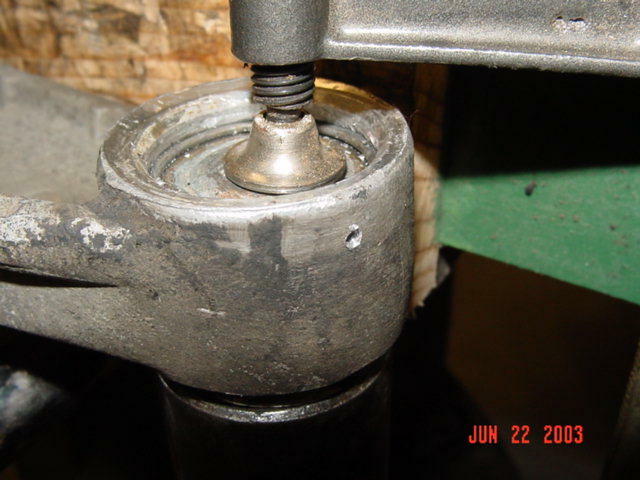 If you absolutely cannot hook the edge of the snap ring ( I couldn't), then first use a hammer & punch to carefully rotate the snap ring opening around to the outer edge of the control arm - this position would be closest to the wheel (if the arm were installed). You can only do this rotation-of-the-snap-ring while the clamp pressure is applied, otherwise the snap ring is pretty securely captured. 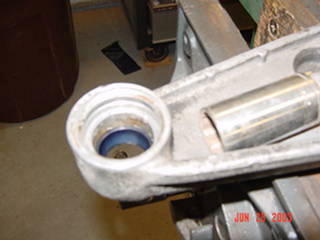 Remove the clamp and drill a small hole (see above left) in the gap between the ends of the snap ring. It is important to drill from the inside - start your hole right next to the edge of the snap ring. The drilled hole must be in the snap ring groove. The drilled hole must be small - removing material means weakening the arm. So use as small a bit as is possible - I used a 3/32's bit because 5/64ths was the smallest tool that I had that I could still apply the needed pressure to push the ring out of the groove. As an alternative to the hole drilling method (which I'm reluctant to do) you might also cut the snap ring with a Dremal or other mini-cutting tool. I haven't seen this done but am told that it is possible - it may take a long time though. 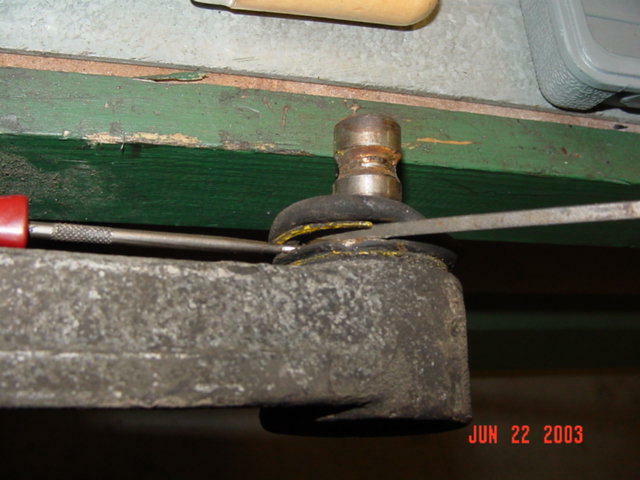 Re-clamp the the ball joint (as before) and drive the snap ring back around to where it just covers the hole. Now use a jeweler's screwdriver or some sharp tool to push through the hole and apply pressure to outer circumference of the snap ring. Push the the ring just out of its groove (I'm using a 5/64th hex driver bit). With the snap ring up, out of the groove a bit, it is easy to hook it with a pick. The ring can then be worked out. With the snap ring out, remove the cap, spring, spring seat, seal & ball seat. 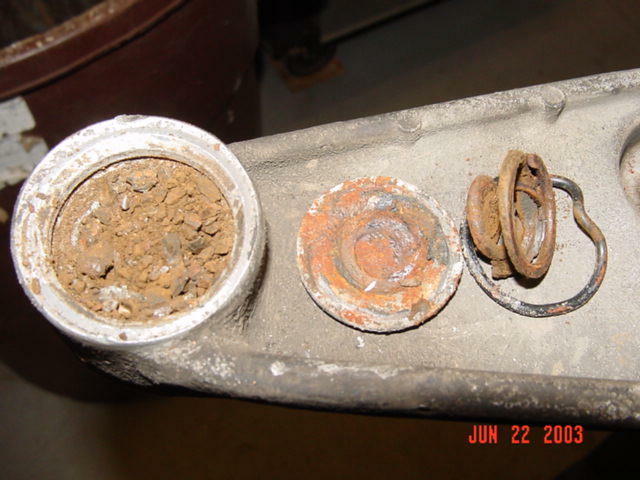 This (above) is the worst corrosion that I've seen. 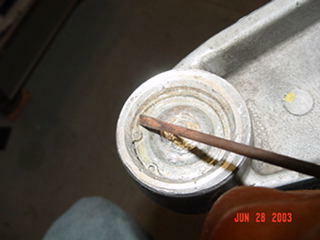 I think the epoxy allowed the cylinder to hold water for long periods of time. I know, water shouldn't even be getting in there but it must have even though this joint had a good boot. Remove the different parts and note their order for re-assembly. 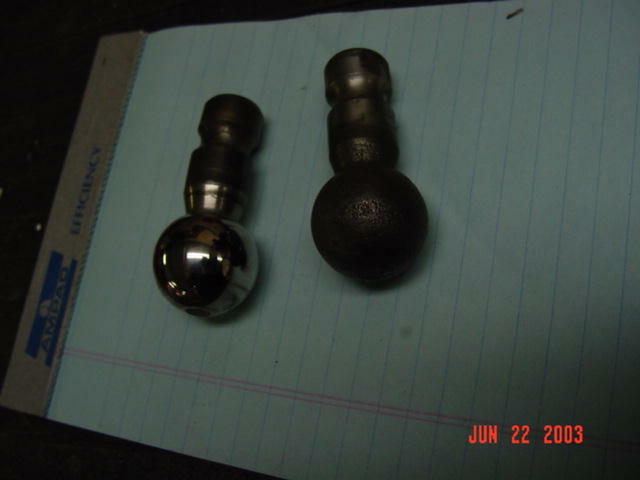 Evaluate your ball joint pin and socket; obviously the pin shown above on the right is worthless. Look for galling or damage to the surface of the ball. If you can see any defect at all it should be replaced. Replace the pin as needed. These ball joint pins can be taken from an early model 944 (you would have to cut open the old style ball joint assembly but the pin should be the same). From the bottom side of the arm, remove the sleeve and clean up the inner surface of the socket (ball joint mounting area). 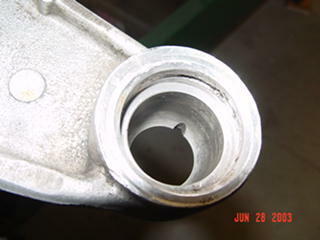 In MANY cases this cylinder is damaged beyond repair and the arm must be discarded. 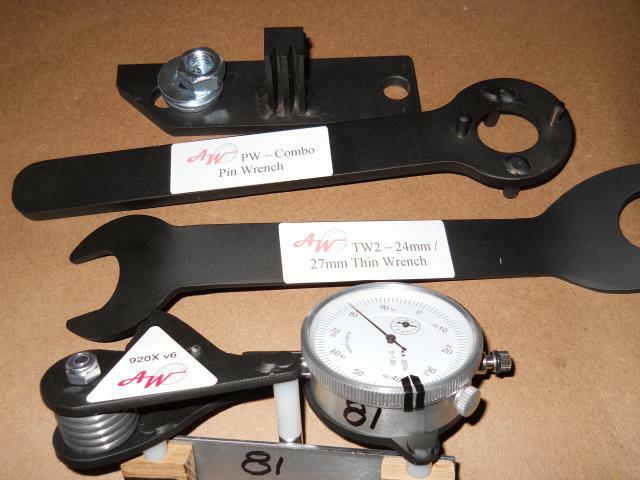 Your kit should give you the specifications or guidance to evaluate this socket. Also take a close look now at the condition of your snap ring groove. Now is the time to remove any burrs or material that would keep the snap ring from seating. Side Note: These kits are available from a number of sources, I chose a kit with some sort of nylon sleeve. This was a major mistake, I should have gone with a kit using brass components - it would have saved me changing these again after only a few months. I used a 13/16ths socket to seat the sleeve then lubed-up the sleeve, pin and pin socket. Next, I simply dropped in each of the parts: (pin, pin seat, spring, seal, spring seat and cap). My kit cam with an new snapring but it was thinner than the original and there was no o-ring either. Notice here that I had to switch to a different clamp, again, you can see I'm using a socket to help clamping. Seating the ring is critical. 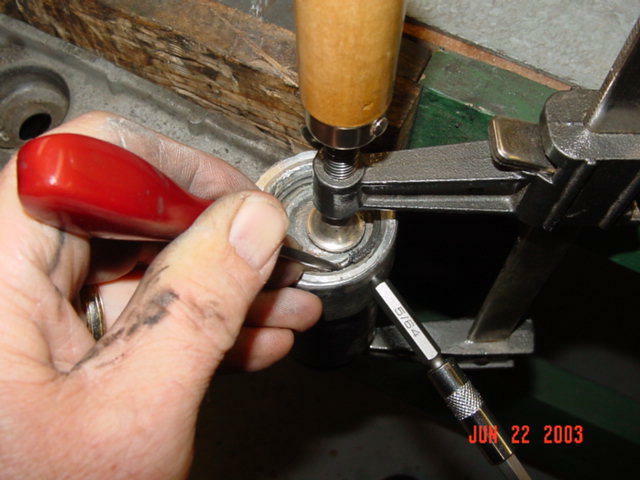 With the ring in place, I slowly work around the inner diameter of the ring, tapping with a screwdriver and hammer to be sure the ring is seated. The last step is to place the boot over the exposed end of the pin and epoxy the ring. The boot that came with my kit looked like it belonged on a tractor but I had some used OEM boots that I used. My approach is different than most Porsche owners, although using steel control arms in place of my 85.5 944 alloy ones was something I learned about on various Porsche forums. I've also learned that a lot of these Porsche owners are very committed to detail, performance and maintaining the pure Porsche spirit. I commend them but ,alas, my project is a daily driver on a strict budget. As it is, you might think I'm taking this budget thing too far by using of Volks Wagon parts on a Porsche. But this is not quite as ridiculous as it sounds. 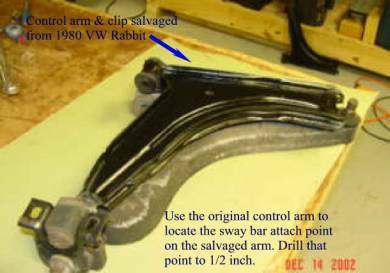 The VW steel control arm of the early 80's Rabbit is also the control arm that was used on Porsche 944 up until late 85 at which time Porsche switched over to an alloy piece. 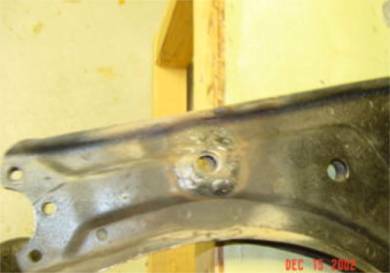 Porsche didn't exactly have an eye on reliability or maintainability though and made it clear that the alloy arm could not be serviced with replacement ball joints - meaning the whole arm must be replaced at a cost of about $400. And, there are 2 of them. First, I called the local VW dealer to get a price on the steel control arm PN 171.407.153D. Cost: $86 each (without bushings). [Since this time I have learned that there are much better sources/prices for these steel control arms]. I also learned from the dealer that these arms were used on Rabbits. I knew too that I would also need to find some "clips" PN 477.407.169 and these are not so easy to find. So off to the local salvage yard I go. Luckily, I found some similar clips on a 80 VW rabbit and grabbed the control arms too. Cost for arm & clip: $11 (per side). One problem with the steel control arms is that they do not have provisions for the sway bar attachment, so below is how I dealt with that. I should also note that, in my case, I have the a 30 mm swaybar, many 944s have a smaller bar - meaning this approach might not work for you. Using my original arms, I located the sway bar attach point and drilled a 1/2 inch hole in the salvaged arms. A little welding of some fender washers (to "bulk-up" the area) and I'm ready to attempt a first fitting. At the time this was to be an experimental version to be replaced later when I buy new steel control arms. The old bushings seem to be in good enough shape so with new ball joints (Cost: $24 each) the arms slide right in and I'm off for a few runs through the local country roads. Note: the "clip" is seen in the picture above - it is the u-shaped piece near the bottom of the photo. This arrangement provides only part of the adjustability that is available with the original piece. 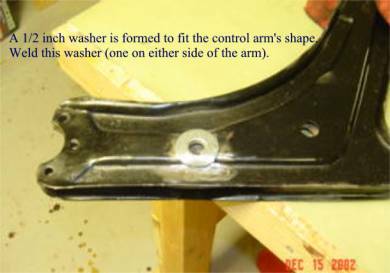 A little "forming" of this washer and some welding is all it took to bolster the mounting area. Well, the experimental version was used on the car for a few months and seemed to work pretty well. I inadvertently banged a few potholes as a general test and I've had the arms completely back off for an inspection. They seem to be holding up perfectly. In fact, things have worked out well enough that I think I'll go ahead and get an alignment and move on with a more extensive road test. Will have to let you know how that works out. Side note: Missouri has some great twisty-hilly roads; no public roads are for all out speed but these are perfect for "spirited driving." Follow-up: These steel control arms work just fine. I'm not racing or even driving the car very hard but handling seems good and the price was right. One small suggestion, if and when I remove them for new bushings, I think I'l go ahead with seam welding, to bring up their strength a bit. Many have written to ask various questions about this part of my project. I admit that I have been interested in restoring my original alloy control arms - they are obviously a high-tech piece that Porsche went to great lengths to develop. This and the fact that specially manufactured ball joints can be refitted has me considering this.